Raize PSP Video Converter is an all-in-one video converter to convert popular video to PSP MP4 format. It supports converting DivX, XviD, MPEG, MOV, MPG, MOD, QuickTime, MP4, 3GP, 3G2, SWF, GIF, DV, MJPEG, VOB, WMV, ASF, AVI to PSP or MP4 video format for Sony PSP. Raize PSP Video Converter also allows you to convert various video to AVI, DivX, XviD, or MPEG formats. On the other hand, you can convert your favorite video to MP3 audio that can be played on your Sony PSP. Many settings are adjustable, for example, you can adjust video size, bitrate, or frame rate, etc... So that the output PSP video will be matched for your Sony PSP. Raize PSP Video Converter combines PSP converter and PSP transfer features. After converting, the video files will be inside your PSP directly, you don't need to copy or move the converted MP4 to PSP manually. This lets you drag-drop to load video files, just drag the video files to the icon or main window, the conversion will be started automatically. Friendly interface, detailed help document. Even a new user, you can use Raize PSP Video Converter within a few minutes without any special learning. You can also convert video to MP4, MPEG-4 format. It supports DivX, XviD, MOV, QT, 3GP, RM, WMV, VOB to MP4 format as well. With Raize PSP Video Converter, you can also convert MP4, or other popular video to DivX format. 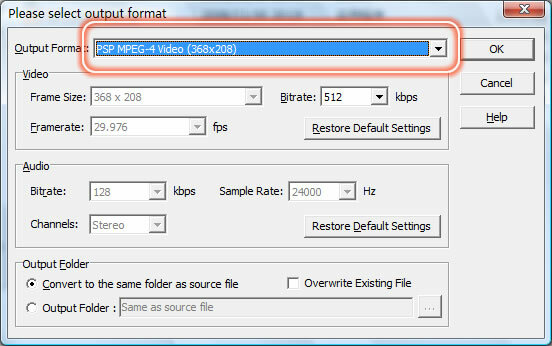 Raize PSP Video Converter can help you to convert your digital video to MPEG format. It supports both MPEG-1/VCD, MPEG-2/DVD/SVCD formats. Extract audio track from video, and convert video to MP3 audio format. AVI to MP3, MPEG to MP3, MOV to MP3.